WHEN YOU THINK OF FLOWERS, THINK OF OURS... CALL BLOSSOM PARADISE GARDENS TODAY! 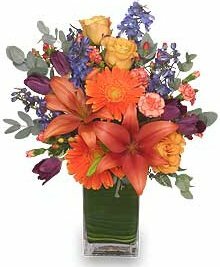 Blossom Paradise Gardens is your full service local florist serving Altamont, Illinois and the surrounding area. Our team of talented professional floral designers have over 43 years of experience behind them and the know-how to make your special moments... just a little more special! We have a greenhouse with a variety of green plants, blooming plants, and fresh flowers. Our shop also carries Willow Tree Angels, silk flowers, cards, balloons and lots of gift items. At Blossom Paradise Gardens, we offer delivery to area funeral homes, including: Kull and Gieseking in Altamont, May-Kessel in St. Elmo, Pagel in Edgewood, Pagel in St. Peter, Claggett in Brownstown, Lockart & Sons in Beecher City and Rankin in Farina. Open all day Monday through Friday, 1/2 day Saturday, closed on Sunday (only funeral work and phone orders).